No need to hunt for your Price Converter cellphone app, when viewing this Red Bull Digital Shelf Edge International Price. It conveniently prices its offers in Dollars, Euros, and Pounds right at the Shelf Edge. 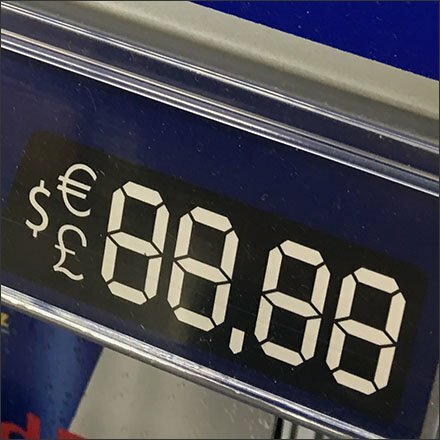 And to make it even more convenient, the prices is exactly the same in all three currencies: 88.88. Running to an even 90 would cut out the need for change, but the sales psychology of 88.88 gives it an edge over 90.00 … unless you display as 90 … fewer the digits in a price also has a “less cost” sales psychology effect. This Red Bull Digital Shelf Edge International Price seen at Food Bazaar, Cliffside Park, NJ.